President Donald Trump ramped up his criticism of the news coverage of his administration Friday, again taking to his favorite social media platform. "The FAKE NEWS media," Trump wrote on Twitter, "is the enemy of the American People!" An initial tweet put only The New York Times, CNN and NBC News on his enemies list. That message was quickly deleted, however, and replaced by an almost identical note that added two more domestic television networks: ABC and CBS. 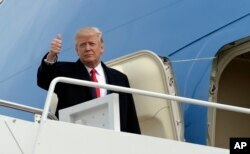 The social media attack, the latest in a long series of Trump broadsides against the news media, came after the president had left Washington for a visit to a Boeing aircraft plant in South Carolina. The president later headed to Florida, where he is to spend the weekend at his Mar-a-Lago complex. President Donald Trump gives a thumbs up from the top of the steps of Air Force One at Andrews Air Force Base in Maryland, Feb. 17, 2017. As the president arrived at the estate he has dubbed the Winter White House, social media and the networks crackled with debate about the significance of Trump calling some of the top American journalistic outlets enemies of the people, a phrase that goes back to ancient Rome and was used with chilling finality during the communist revolution in Russia a century ago. "As an American diplomat, I stood up to petty tyrants who called journalists 'enemies of the people,'" tweeted Tom Malinowski, former assistant secretary of state for democracy, human rights and labor. "Guess that's not our policy anymore." "It is one of the most controversial phrases in Soviet history," said Mitchell Orenstein, professor of Russian and East European studies at the University of Pennsylvania. The phrase has its roots in Latin, during the Roman Empire, but "enemies of the people" gained its most notorious associations during the 20th century, during the purges ordered by Soviet dictator Josef Stalin that killed tens of millions of people. FILE - Facemasks depicting former Soviet dictator Josef Stalin and U.S President-elect Donald Trump hang on sale hours before Trump is to be sworn in as president of the United States, at a souvenir street shop in St. Petersburg, Russia, Jan. 20, 2017. An "enemy of the people" in the Soviet Union was not necessarily a criminal, but more often someone stigmatized by social origin or pre-revolutionary profession. The label alone was akin to a terminal illness, and merely being a friend of an enemy of the people was a certain cause for official suspicion. "What it basically meant was a death sentence," Orenstein told VOA. China's dictator Mao Zedong also denounced as "enemies of the people" those who criticized the Maoist policies and commands that led to the Great Famine and the death of tens of millions of Chinese. 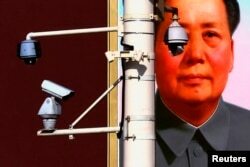 FILE - Security cameras in front of the giant portrait of former Chinese Chairman Mao Zedong on Beijing's Tiananmen Square, Nov. 11, 2012. There is no evidence that Trump was aware of the historic connotations of the phrase when he wrote his tweet, and VOA’s request to the White House for clarification was not immediately answered. However, Orenstein, who teaches one of the few courses on communism at an American university, said, one would hope "American presidents would be educated enough to know something like that.". Congressman Ted Yoho, a Republican on the House Foreign Affairs Committee, dismissed the tweet as not particularly consequential when asked about it on CNN. The president "has got his style," Yoho said. "Things will adjust." In a dispatch shortly after the second Trump tweet, the French news agency noted that while many U.S. presidents have criticized the press, "Trump's language has more clearly echoed criticism leveled by authoritarian leaders around the world." Can radical language justify violence? J.M. Berger, a fellow at the International Center for Counter-Terrorism at The Hague, is among those who agree with that characterization, calling Trump's language "radical." Some of Trump's supporters on the extremist fringe "may see language like 'enemy of the American people' as ratifying violence," Berger told VOA. The president's tweets "could also incite others who are inclined toward violence, whether because of a political ideology or mental illness," said Berger, author of several books and studies on extremist group's use of social media.